MOSCOW, Russia -- European leaders on Friday broke from last-ditch negotiations without reaching an agreement to calm an escalating conflict in eastern Ukraine, as new splits opened between the United States and Europe over whether to bolster Ukrainian forces with arms shipments. A woman reacts as she waits for humanitarian aid in front of a delivery point in the Ukrainian forces-controlled town of Debaltseve, Donetsk region on Friday. Kremlin talks between the leaders of Russia, Germany and France stretched for more than five hours, but they ended early Saturday with no conclusion, a sign of the bitter divisions between the two sides. The leaders planned to continue the negotiations over the weekend and to speak again by telephone on Sunday. The core of the deal appeared to be a return to a tattered cease-fire agreed to in Minsk, Belarus in September. But Ukraine and Russia have differed over crucial issues such as how much territory would be left under the control of the rebels, who have captured hundreds of square miles since the deal was inked last year. The Moscow visit by German Chancellor Angela Merkel was her first since the conflict in Ukraine erupted nearly a year ago, and it was a sign of the high stakes she assigned to reaching an agreement. But both French President François Hollande and she sped to a Moscow airport after midnight and departed, giving no statements. “Joint work is being done at the moment to draw up the text of a possible joint document on implementing the Minsk agreements, a document that would include the Ukrainian president’s proposals and proposals formulated and added today by Russian President Vladimir Putin,” Kremlin spokesman Dmitry Peskov told reporters early Saturday. “Preliminary outcomes” will be discussed on Sunday in a telephone conversation between the Ukrainian, Russian, German and French leaders, Peskov said. The burst of diplomacy came as the White House deliberated on whether to arm Ukraine’s military with powerful tools such as antitank missiles, surveillance drones and advanced radar. That possibility appears to have opened rifts between Washington and Europe, which have thus far been unified in their efforts to put pressure on Russia. One top German official said Friday that sending weapons to Ukraine was a dangerous idea. “Focusing merely on weapons deliveries could add fuel to the conflict,” German Defense Minister Ursula von der Leyen told an international security conference in Munich, strongly cautioning the West against providing arms to Ukraine. Russia, she argued, could simply funnel an unlimited number of arms to the separatists. She suggested using economic levers against Russia instead. Von der Leyen’s comments underscored the sharp differences between European capitals and a segment of policymakers in Washington who are arguing in favor of providing weapons. Ukrainian officials said any agreement to stop the fighting must adhere to principles agreed to for the previous cease-fire in September, raising questions about how durable any new peace plan could be. The September agreement quickly broke down. Officials briefed on Putin’s newest suggestions for a resolution said he wanted to put in place measures that would effectively turn eastern Ukraine into a frozen conflict zone similar to those in several other former Soviet republics, including Moldova and Georgia. Those territories give the Kremlin powerful sway over their national governments. The Minsk agreements demand that Russia seal its porous border with Ukraine to prevent arms and fighters from flowing in. It also envisioned more autonomy, but not full independence, for the rebel-held areas. 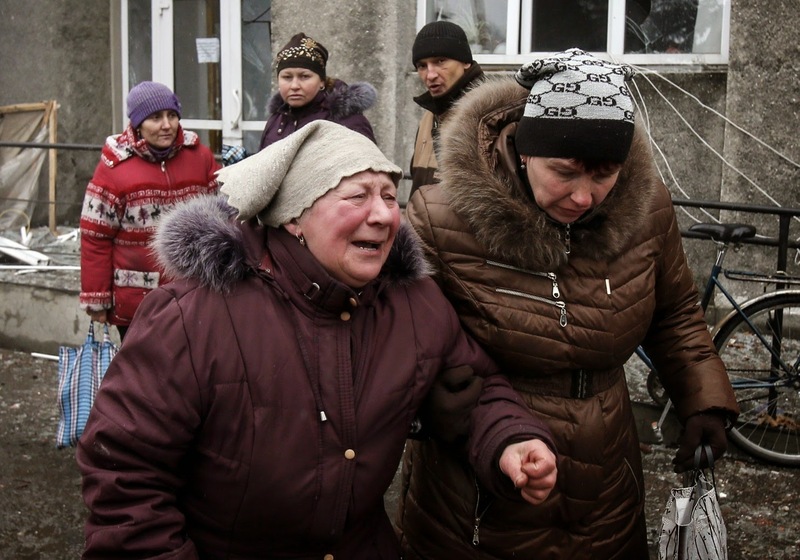 Ukraine and its western allies accuse Russia of fueling the conflict with troops and weapons. The Kremlin acknowledges that Russian citizens are taking part in the fight, but it denies any role in the war. The fighting has claimed at least 5,350 lives, according to U.N. estimates, and hundreds of thousands of Ukrainians have been displaced from their homes. Ukrainian officials expressed worries Friday that any split between the United States and Europe over the arms shipments would give the initiative to Putin. Putin’s “interest lies in the maximum destabilization for the situation in Ukraine,” a Ukrainian diplomat said, speaking on condition of anonymity to discuss the state of the negotiations frankly. “As soon as he sees any break in the front of the West, the U.S. and the E.U., he will definitely see it as a spark for more actions,” the diplomat said. Russian leaders also warned that any peace proposals could be crushed if Washington decides to arm Ukraine’s military. Hollande and Merkel headed to Moscow a day after talks in Kiev with Ukraine’s Western-allied president, Petro Poroshenko. Merkel is scheduled on Saturday to address a conference in Munich at which Poroshenko, Secretary of State John F. Kerry, Vice President Biden and Russian Foreign Minister Sergey Lavrov will also be present. Merkel is scheduled to meet with President Obama in Washington on Monday. “We are convinced that there’s no military solution to this conflict,” Merkel said Friday in Berlin, ahead of the Moscow talks. NATO’s top military commander, U.S. Air Force Gen. Philip M. Breedlove, said Friday that it was a mistake to take stronger steps off the table. Options in the “tool bag” of responses in Ukraine should include military measures alongside other ones, Breedlove said in Munich. “If what is being done is not producing what you want to gain from the conversation, then maybe all tools in the tool bag should be used, and conventional means should not be outwardly discounted,” he said.